Another week, another birthday cheesecake. But this one is very different to the last one, it's baked and it happens to be gluten free. 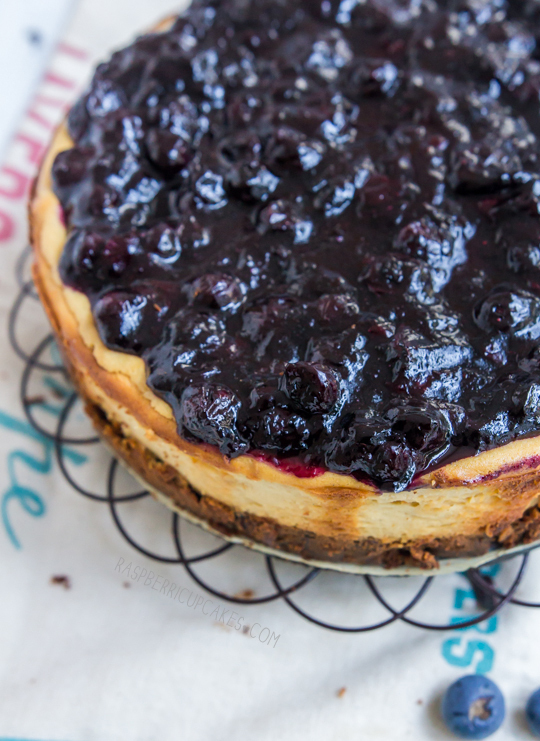 I'm not experienced at all in gluten-free baking, but my sister in law can't have gluten and she loves cheesecake and requested a blueberry cheesecake (same as last year!). It isn't the prettiest of cheesecake (my baked cheesecakes always seem to turn out kinda fugly), but it's really, really tasty. 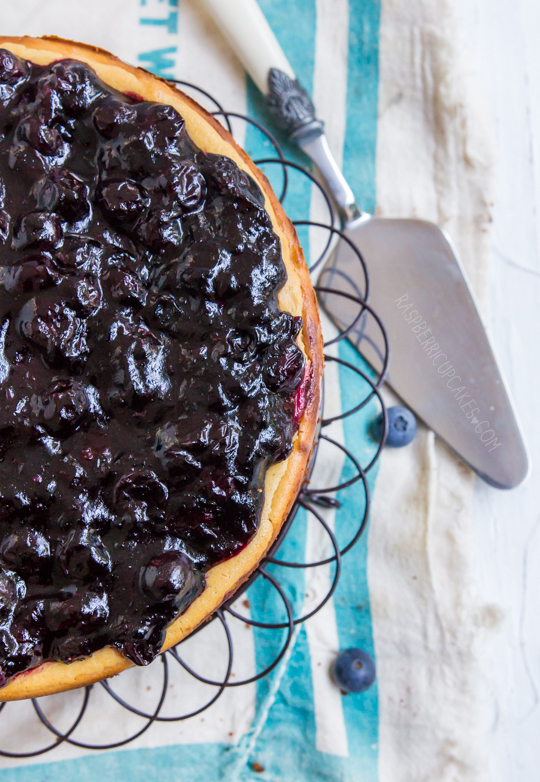 The base is made with gluten free gingernut biscuits (which you could always replace with regular ginger biscuits), the filling is a baked ricotta cheesecake with maple syrup and vanilla bean and I made a thick blueberry topping similar to a pie filling. No innards shots as this is a birthday dessert, but you all know what the inside of a cheesecake looks like. It's the same recipe as this strawberry ricotta cheesecake, with a few tweaks. The ricotta keeps the filling light and fluffy, which is good since I usually find baked cheesecakes too dense for my liking. I nearly had another cheesecake disaster, can you believe it? The latch on my springform tin broke off while I was trying to carefully remove the cheesecake from the tin, and the tin was jammed shut and refusing to spring loose. I had to pry the thing apart with pliers. Luckily the cheesecake is in one piece and ready for dinner. 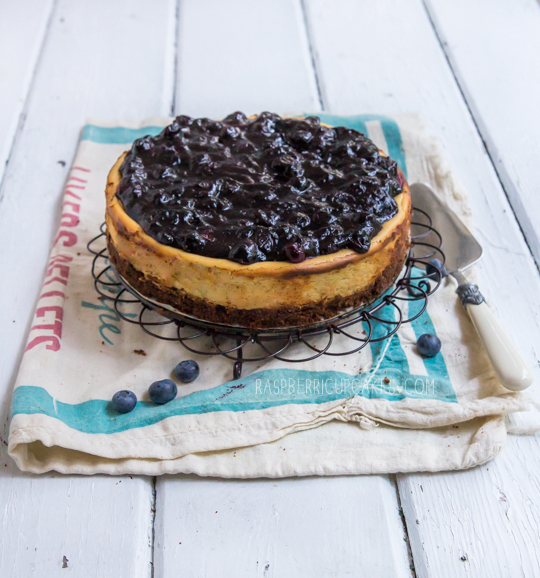 Hopefully I'll be back soon blogging about something other than a cheesecake recipe! Preheat oven to 165°C (330°F) (150°C(300°F) for fan-forced), grease and line the base of a 20cm round springform tin. Place ginger nut biscuits in a food processor and pulse until they are broken down to even crumbs. Add butter and pulse to combined. Press into the base of your prepared tin and bake in oven for about 10 minutes, take care that it does not burn. Prepare the filling; place cream cheese, ricotta, maple syrup, lemon zest and vanilla bean in the bowl of a food processor and pulse until smooth. Pour mixture over the chilled base and bake for an hour. The edges should be just golden and the centre might still be wobbly. Do not remove cheesecake from oven, turn off the heat and keep the door closed and allow the cheesecake to rest in the oven for another hour. Then remove from the oven and sit in tin on a wire rack until completely cool. 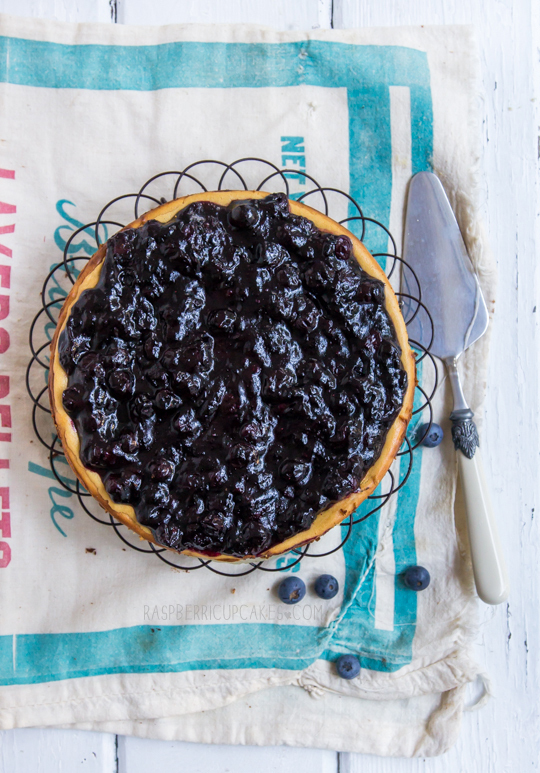 Place blueberries, sugar, lemon juice and vanilla in a medium saucepan and place on medium heat. Stir over heat until sugar dissolves. When cheesecake and filling are cool, spread mixture carefully over the top of the cheesecake. Run a sharp knife around the inside edge of the pan and then carefully remove from the springform tin. Keep chilled until ready to serve. I have recently ventured in to the world og gluten free/vegan/ other free products too. So very different but delicious none the less. Hope you had a wonderful birthday! This looks delicious! Ive had the springform tin do that to me, i ended up breaking the cake tin! goregeous cheesecake btw,! Yum! I recently tried a gluten free no bake cheesecake, but this one looks lovely. 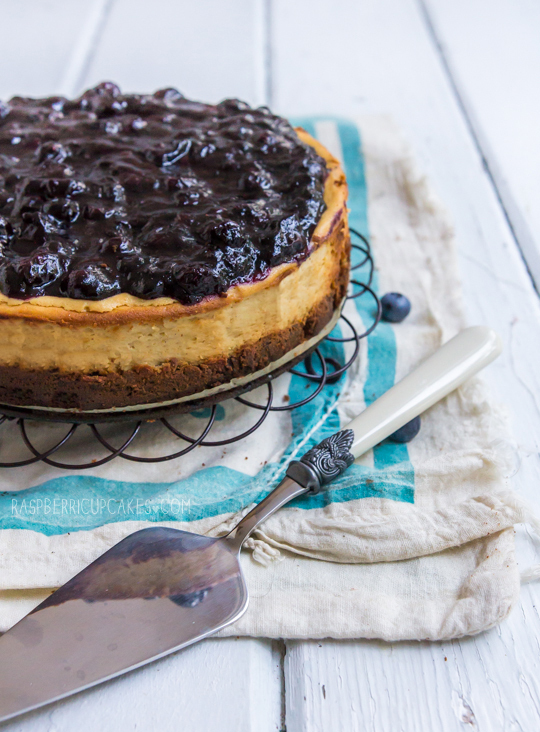 I love cheesecake, just looking as yours makes me feel desperate to make one! Hope your sister-in-law enjoys it! I'm going to have to do some baking with your ricotta base recipe. I've yet to bake a decent cheesecake. I'd like to say it's the pan, but I fear it's the creator. Yours looks perfect! It's not fugly, it's rustic. At least, that's what I tell myself. lol. And springform disaster! Glad the cheesecake made it out unscathed! I've been following your blog for quite a while and I've enjoyed trying out some of the recipes too, however last year I was diagnosed with coeliac disease and have been super disappointed that I can no longer sample most of what I bake. The gluten free baking failures I've had have been MANY too, which is very frustrating. Anyway, I was so excited to read that this is gluten free! I'm going to make it tonight. Thanks so much! Delicious! That thick berry topping looks absolutely sinful.